Scout Mathiisen for signs of the Veiled Heritance. Mathiisen — Investigate the Heritance presence in Mathiisen. I'm working with Razum-dar, at the town of Mathiisen. He's looking into reports of the Veiled Heritance in the area for Queen Ayrenn. Search Fistalle's House in east Mathiisen. Razum-dar tells you to meet with agent Fistalle in east Mathiisen. Fistalle's house is across the bridge and to the right. When you enter her house, however, you find Fistalle dead on the floor. You search her body and find a strange note. You take the note to Razum-dar who has moved to behind the barracks to the NE of Fistalle's house. Razum-dar realizes that the note is a code from Fistalle that explains who she suspected. The rat with the blade refers to Condalin, the forgemaster who controls the smithy. You may note that Condalin's house is next door to Fistalle's. The forge is east of Razum-dar and Fistalle's House and next to the docks. You find the armament inventory and bring it to Razum-dar. Razum-dar wants you to investigate Malanie's house. Enter the house and search the wardrobe across from the door. Inside is a Veiled Heritance Officer's Uniform. You report to Razum-dar who is behind the house. The uniform proves that Malanie leads the Veiled Heritance in Mathiisen. 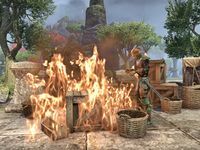 This quest originally involved gathering kindlepitch from the warehouse next to Razum-dar and using it to set fire to a crate of linens outside Malanie's house in order to distract the guard, whom Raz would later kill. This step has since been removed. Raz is worried about being recognized in Mathiisen. He's asked me to meet with one of his agents, Fistalle. Fistalle is dead. Perhaps she left behind some information that might be of use to Razum-dar. Razum-dar mentioned he'd meet me behind Fistalle's house. I should bring him the information I found on Fistalle's body. The note on Fistalle's body mentioned the forgemaster. Raz requested I search the forge for additional information. I uncovered evidence implicating Condalin the Forgemaster. I should report this information to Razum-dar. Razum-dar suspects that the Canonreeve of Mathiisen may be the other rat mentioned in Fistalle's note. He wants me to sneak into the Reeve's home. Malanie appears to lead the Heritance in Mathiisen. I should report this to Raz. Finishes quest I need to speak with Raz so that we can plan our next move. This page was last modified on 9 April 2019, at 02:05.